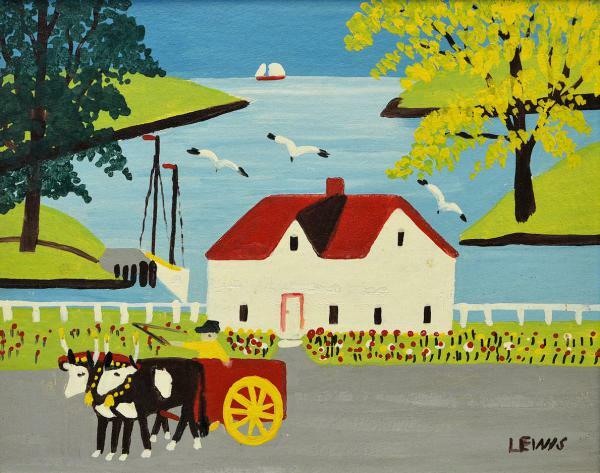 Between 1945 – 1950, people began to stop at Maud Lewis’ home and buy her paintings for two or three dollars. Only in the last three or four years of Maud Lewis’ life did her paintings begin to sell for seven to ten dollars. Maud Lewis achieved national attention as a result of an article in the “Star Weekly” in 1964 and in 1965 she was featured on CBC-TV’s Telescope. Unfortunately, her arthritis deprived her from completing many of the orders that resulted from the national exposure.